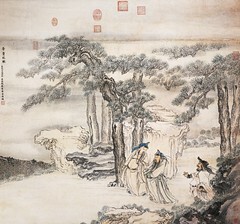 Qian Xuan (錢選, 1235-1305), courtesy name Shunju (舜舉), pseudonyms Yutan (玉潭, "Jade Pool"), Xilan Weng (習嬾翁) and Zhachuan Weng (霅川翁) was a Song loyalist painter from Wuxing (吳興), which is the present day Huzhou (湖州) in Zhejiang. He started as an aspiring scholar-official during the Southern Song. He had difficulty climbing the ranks and when the Mongol-founded Yuan Dynasty took over South China in 1276 he gave up the idea altogether. 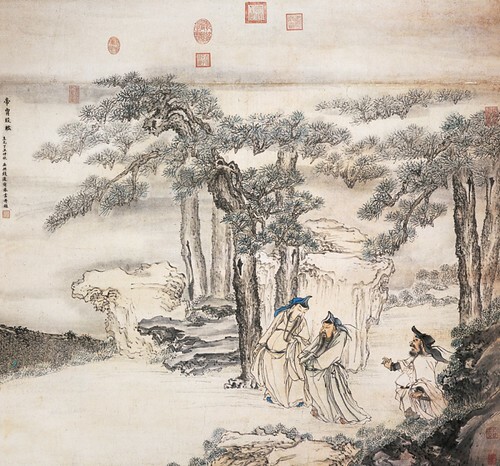 Although in 1286 his friend Zhao Mengfu (趙孟頫) accepted a position and so for a time it seemed he could as well, but he refused on patriotic grounds by citing his old age. His life after 1276 was devoted to painting and he became noted as a flower-and-bird painter. He was also adept at figure painting and landscape painting as well.